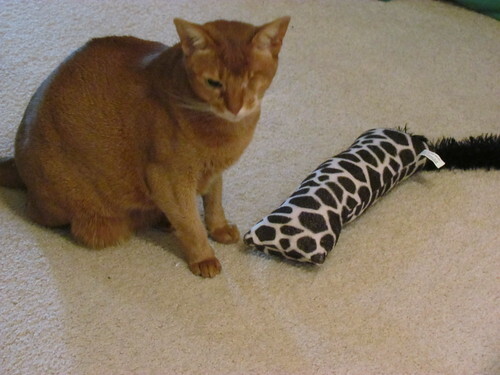 Two kitty dedicated posts - you know you love them. Sweet little fuzzy faces, what is not to love? 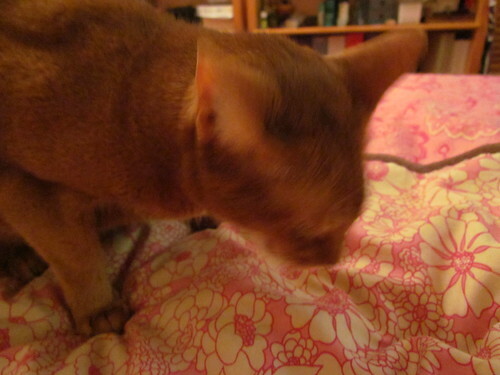 Anyway, I am much more timely with Possum's birthday post than I was with Sahara's (which was about a month late). Who is Possum? Possum is my family cat. 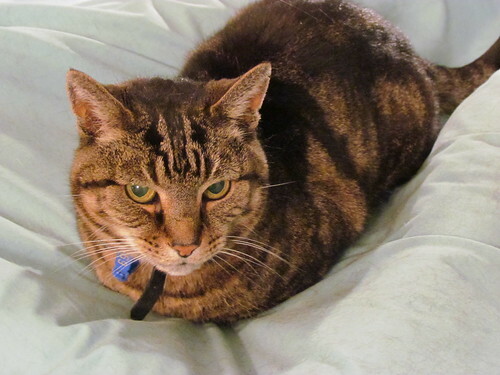 I live with four cats at home - my three girls and the handsome Possum, who has been very gracious about having his solitary life interrupted by my three kids for the past three and a half years, with probably many more to come! 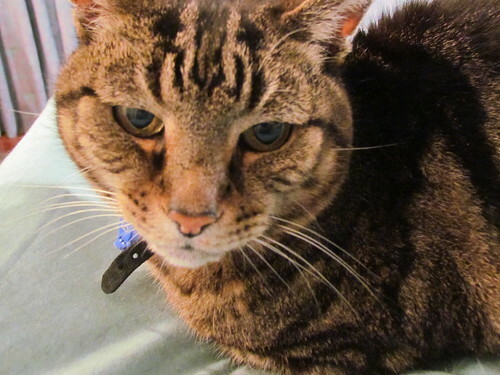 Possum turned 17 on the 28th of September. He enjoyed some of his favourite special treats. I was out at work all day and had a vet meeting until late that night, so I didn't have much time to spend with him on his birthday. I did take these adorable photos of him before bed. Tomorrow is the first of October, which means it is Vegan MoFo! I will be participating this year, and I am determined to make the quota this year! It's hard to realise that your little ones are growing up. Especially when they are so very little and cute and furry. But apparently not even my will can stop the passage of time. 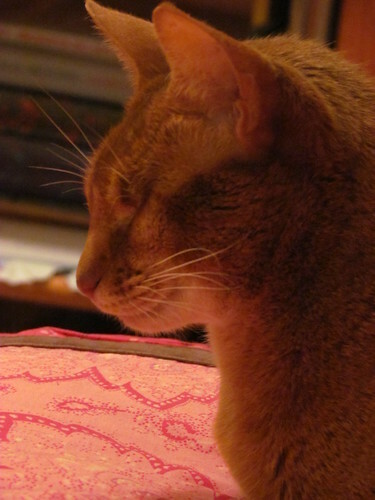 Sahara had her tenth birthday on the 28th of August - my youngest hit double figures. 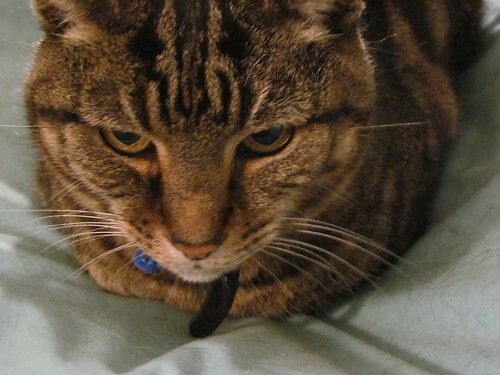 Here she is the night before her birthday, still only nine years old. When we woke up on her birthday, she started the day with some Greenies in bed. Sahara loves her Greenies! Then it was downstairs for some morning oatmilk. 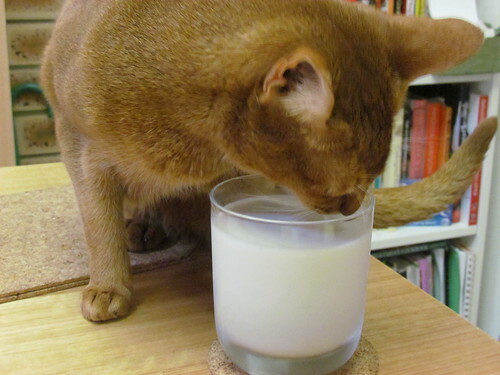 Actually, this wasn't a birthday treat - Sahara likes to share my oatmilk with me every morning! She spent the day as she always spends her days - lounging around, napping, playing in the cat max, chasing toys and being adored. 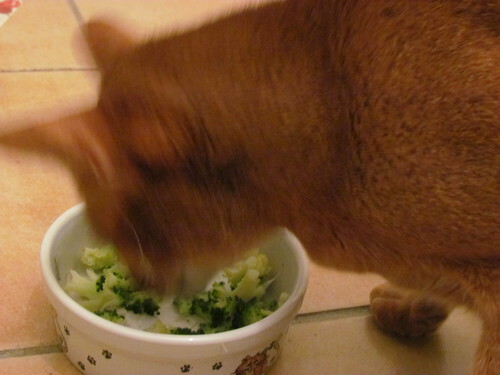 For dinner, in addition to her normal dinner (which is super non-vegan so I didn't get a photo of that) she also enjoyed a bowl of steamed broccoli. Broccoli is one of Sahara's favourite things, and whenever I make it she is always around, trying to steal it off your plate. She was very happy to get her own bowl of it, just for her! Here she is with her present - a Kong Kickaroo! She loves to kill things, and the bigger the better, so this is great for her! She knew what to do with it straight away, unlike the other two - they think it is more of a Sniffaroo and just like to smell the catnip. I haven't been able to get a photo of her playing with it yet, she always knows and jumps up quickly! One day. Love you my little bear! When I returned to Brisbane, I experienced post-holiday blues like never before. I had just spent two and a half weeks in a magical vegan paradise, eating amazing food and hanging out with fantastic people (like Amber, Meg, K and Toby). And then I came back to Brisbane, which is hardly a vegan mecca. I stood in the local vegetable shop and shook my fists at the single leafy green option of sliverbeet. I wept on the inside at the ice cream freezer in Coles, with its sole offering of So Good Vanilla. At least I was reunited with my three most loved kitties! I had brought a bit of America back with me, though. My original carry on suitcase had been sent home as checked luggage, stuffed to the brim with food I had bought for the journey home! * Theo Organic Fair Trade Cherry and Almond chocolate: Yummy. * Theo Organic Fair Trade Peppermint chocolate: Tasted like toothpaste. * Theo Organic Fair Trade Toasted Coconut chocolate: Like a coconut rough! * Theo Organic Fair Trade Orange chocolate: Of course, delicious. * Vegan Truffles: I was a bit underwhelmed. The chocolate was meh and the fillings were just OK. I am used to being blown away by truffles. * Rescue Chocolate Pitbull Bar: Peanut Butter, chocolate, rice crispy amazingness that helps animals, hell yes! * Justin's Peanut Butter Cups: Oh my god, these are the best peanut butter cups I came across! * Theo Fig, Fennel and Almond chocolate: A very interesting blend. I liked it. * Whittaker's Dark Orange bar: Again, of course, delicious! * Wanaka Chocolate bar: OK, not the best chocolate I've had. * Whittaker's Dark Peanut Slab: Yummy! Whole peanuts in a brick of dark chocolate. * Whittaker's Ghana Peppermint Block: OMG so amazing. Not even remotely like toothpaste. Gooey peppermint fondant is enclosed in each dark chocolate square. Addictive, delicious and amazing. * Cocomels: Both vanilla and salted flavour, these are amazing! The salted is my favourite. * Assorted little cups, including peanut butter, almond, raspberry and caramel: Very tasty! *Peanut Butter Newman-Os: These are amazing. I only have six left. They might be the only six left in the whole of Australia. I want more!! * Cliff Bars: I enjoyed these! Especially the peanut butter based ones. * Luna Bars: Not such a fan of these. Too artificially sweet or something. * Larabars: I enjoyed these! 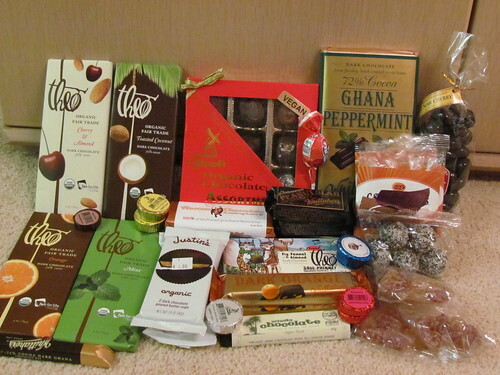 I ate many flavours while I was in the US. 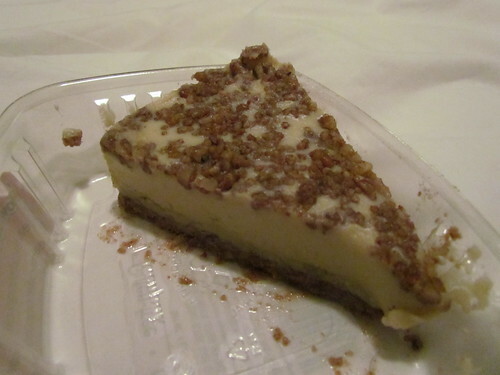 Coconut Cream Pie is my absolute favourite! Then peanut butter and PB&J. * Halo Bars: Very nice, though quite sweet, but they have healthy looking things in them so it's OK.
* Eli's Earth Bars: Oh my goodness, these are amazing. Their version of a Snickers blows Jokerz out of the water. So wonderful. * Dried Persimmon Slices: Tasty and sweet. * Cafe Gratitude Thumbprint Cookies: Not bad, though very soft. * Peanut-Butter Filled Pretzles: I may or may not have eaten most of the bag in one sitting. Delicious. * Dried Mixed Cherries: Yet to be used! * Mori-Nu Pudding Mates: Yet to be used! I have some recipes needing them. Should have brought home more vanilla flavoured ones. * Tings. Like vegan cheesy Twisties, but way better. Oh I love these! * Tofurkey Peppered Jerky: Really nice. * Plantain Chips (plain): Delicious with mexican-style cream Sheese. * Food For Lovers Queso: Oh my god, I forgot I had this! K and Toby gave it to me after they got it because it contains wheat, and I managed to get it all the way home without smashing in the bag. Must eat! * To see what I thought of the packaged Mac and Cheeses, click here. 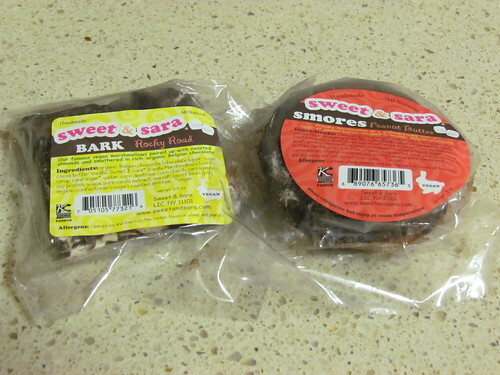 Sweet and Sara goodies. Oh yeah. Rocky Road (yum) and a Peanut Butter Smore (heaven). This trip was amazing, and I am so thankful to the university, ACVIM and the universe for allowing everything to line up. I had such an amazing time! And so many amazing memories. Of course, this has just opened my eyes to all that there is there, and I am hopeful that I will get to spend more time in America! Here is a list of things I am dreaming about getting to do, inspired by the most recent trip. * Spend a whole day at Back to Eden Bakery (PDX) eating everything! * Just spend more time in Seattle in general! * Eat onion rings and a cheesesteak (both things I meant to eat, but didn't end up eating this time around). * Buy that marshmallow fluff stuff to bring home. And that is just based on the cities that I have been to! Then there is the list of cities I still want to go to. So, basically, I am planning to come back. And when I am there I will eat and eat and eat. And hopefully have more amazing vegan adventures with friends old and new. It happened. I woke up and it was my last day in the US, after two and a half weeks of just all awesome, all vegan, all the time, it was over. But, in happier news, my plane didn't leave until 9.30pm, so I still had the whole day to play! For breakfast, it was back to Saha to try their vegan breakfast item - a vegan benedict. 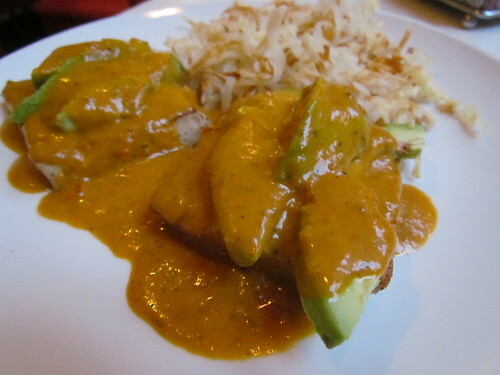 It had tofu slices, avocado and hashbrowns in a mellow curry sauce. I was surprised it didn't come with any toast. On my way out, I snapped a photo of the brunch menu (not on the website) so I could know exactly what I ate, and according to the menu it should have had toast. I have no idea where my toast went. I would have loved some toast with it, because while delicious it was not hugely filling to my usual breakfast standard. 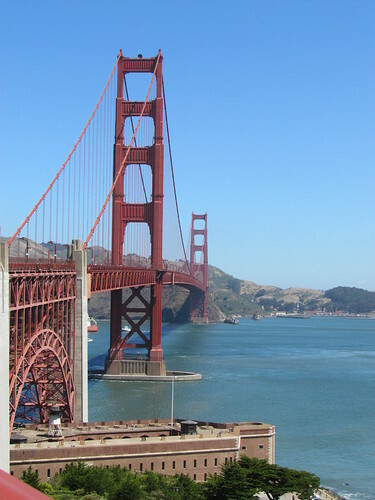 Thankfully I had packed some snacks in my bag, as I prepared to brave the bus system and head out to the one and only Golden Gate Bridge. To be honest, I was surprised it wasn't easier to get there, it was kind of confusing. Thankfully there were a bunch of us trying to find our way there so we banded together. I caught one bus, which dropped us off at a big intersection and then we had to scurry around trying to find where the next bus left from. Eventually though, we did and were deposited at our destination. And WOW! San Francisco had put on an amazing day for my last day in the US, and this just took my breath away. So picture perfect and beautiful. One of the downsides of being a lone traveler, is that you are always the one taking the photos and never in them. I am way to suspicious to give my camera to random strangers and ask them to take a photo of me. So Francesca the travel cat stands in. I originally wasn't going to walk the bridge. But once you are there, on a day like that day, it is impossible not to. So I walked all the way over, and then all the way back. Dodging bicycles every five seconds! 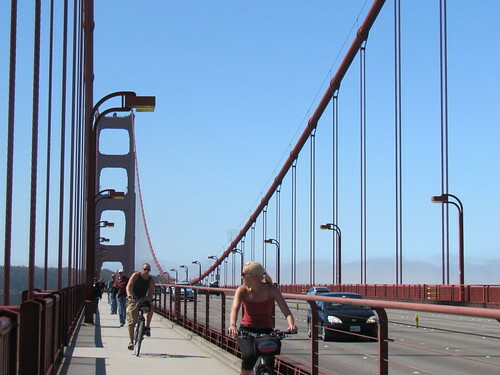 There are a lot of companies that hire bicycles to ride across the bridge, but sadly most of these tourists have no idea of how to safely share was pedestrians. There were some close calls! 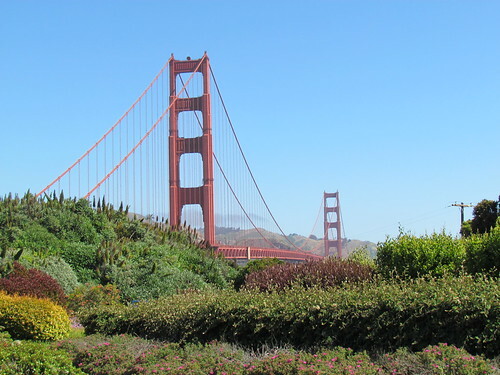 Anyway, there was also the view, and the bridge. Here are some photos! I actually took about a trillion photos, but you get the gist. GORGEOUS! 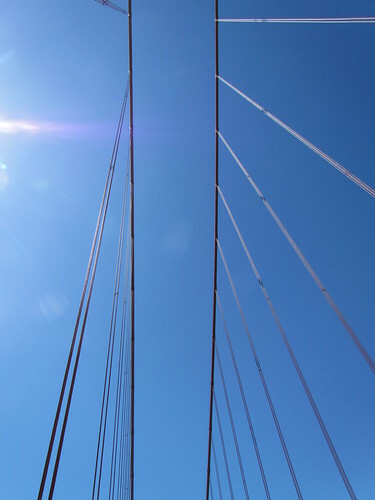 If you go to San Francisco, you must go to the bridge. 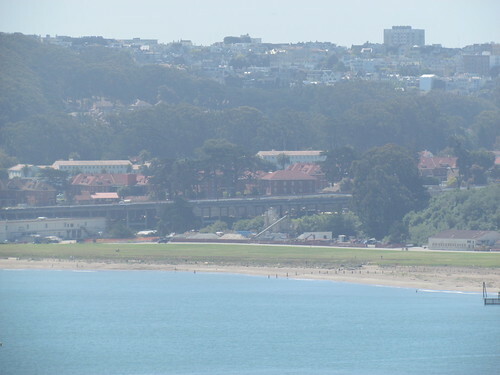 Yes, you can see it in the distance from Pier 39, but it doesn't compare to actually being there. 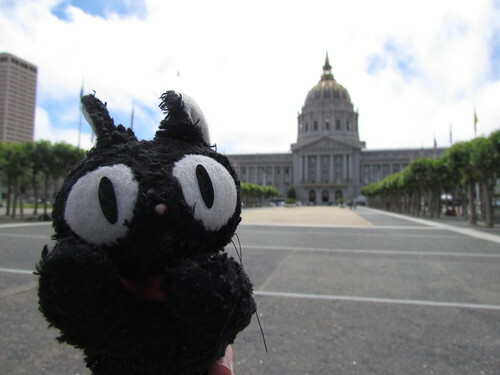 After my magical bridge experience, I had a mission and needed to get back to the Ferry Building. I had painstakingly planned a trip using Google Maps, but then the bus driver told me it was the wrong bus and to catch the other one. I should have done what Google told me, because this way I ended up on a very confusing two-bus trip. The bus was crowded, and there were actually some super rude people on it, which surprised me because everyone had been so lovely up until this point! The bus did go through Chinatown though, which was nifty to see. I ended up getting off somewhere not quite where I wanted to be, because I just couldn't take the crowded, rude bus situation and I needed some air. I had a map, and in theory wasn't that far away. 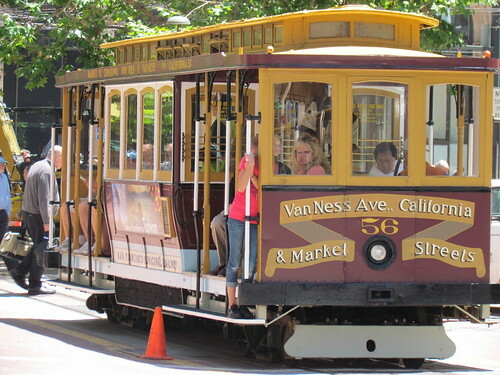 The plus side of this random detour was that I ended up catching a cable car, which are very iconic to San Francisco. I hadn't needed to take one previously. At $5 for a single trip, they are an expensive way to travel, but for the sake of a tourist experience, I am glad I got to do it once. I made it back to the Ferry Building. 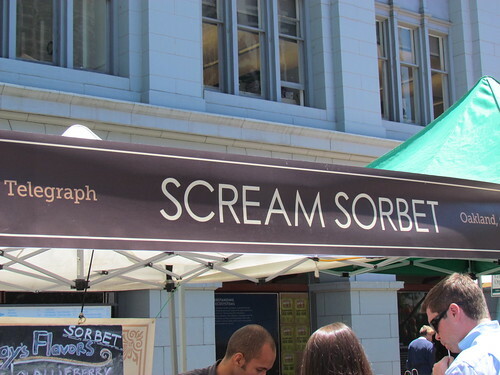 K and Toby had tried some Scream Sorbet when they were in SF and highly recommended it, and there was a thread on the PPK going crazy for it. So I actually changed my plans a little to make sure I could get to try some. They have a stall at the Ferry Building markets every Thursday morning. So many delicious flavours! I really wanted to try the Coco Thai Basil, but they were only selling that by the container and that really wasn't practical for me! 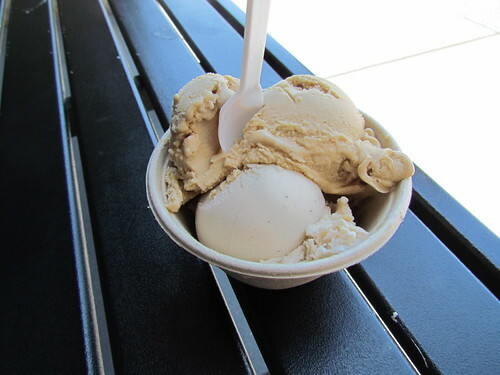 I tossed up long and hard, and ended up getting Cashew Caramel and Vanilla Macadamia. Oh my goodness! These were amazing. So creamy and rich, for a second I was worried, but the ingredients are all 100% vegan! 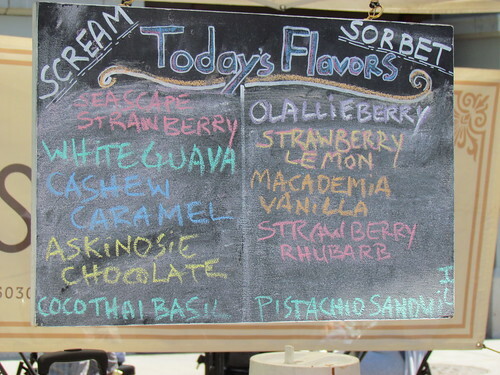 I wish I had gone back for a second round - I would have gotten strawberry and guava! A must have if you are in the Bay Area. I ate my sorbet looking out over that beautiful view of the bay. Afterwards, it was onto the F Line tram and heading back to the Mission for my lunch mission. I had considered going to Paxti's Chicago Pizza, however they didn't seem to sell by the slice and also had long wait times according to the website. I definitely want to get there one day, though! 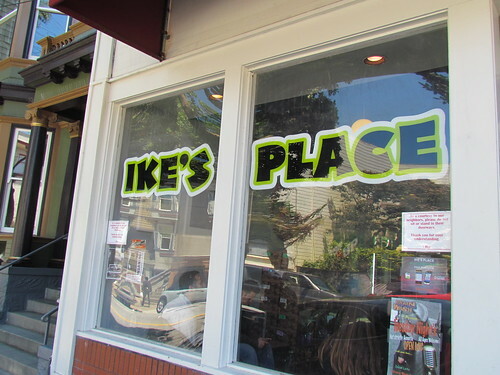 Ike's Place had been spoken about on the PPK as a pretty awesome place for a sandwich, so this is where I went for lunch. The shop itself has no seating, and it was packed full. It really is just an order and on your way kind of place. The website has quite an extensive menu of vegan options, though they weren't all up on the menu board at the shop. Apparently you can order off the board, but I couldn't remember what was on the website so just went with a choice that was clearly on offer. 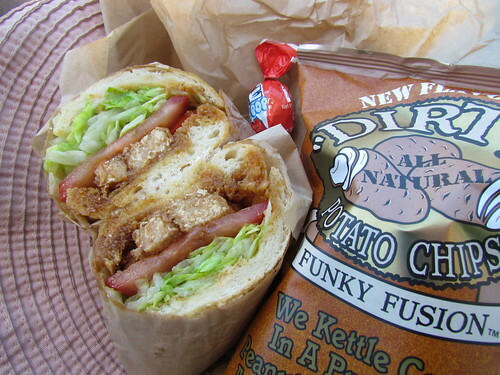 I had the Vegan Ugly Owl, which was vegan breaded chicken, teriyaki and soy cheese, with lettuce and tomato. Each sandwich comes with a packet of chips (which I didn't eat, but did bring home for a vegan friend keen for some savoury snacks), and I also got a bonus vegan lollypop for being vegan, which was nice. The only problem with Ikes is that there seemed to be NO WHERE to sit and have your sandwich in the area. I ended up sitting at the tram station with cars whizzing past eating this. The sandwich was great, but a bit more ambience would have been nice! 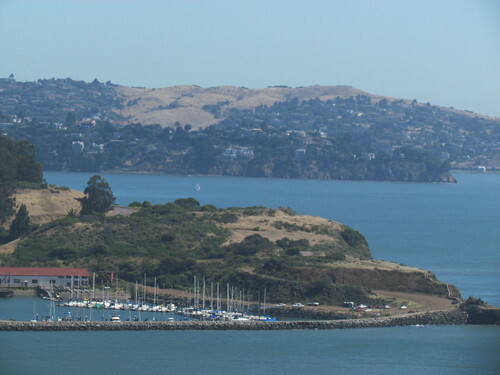 I had planned on going into Japantown that afternoon, but that was before I decided to walk the bridge, so I ended up just getting the tram back to the ferry building. My trip was sort of ending where it originally began, on that first magical day when I arrived in the US two and a half weeks before. 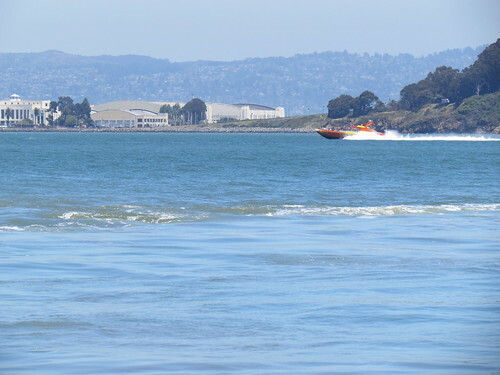 Sitting on the benches at the Ferry Building, overlooking that beautiful bay and enjoying the warmth. 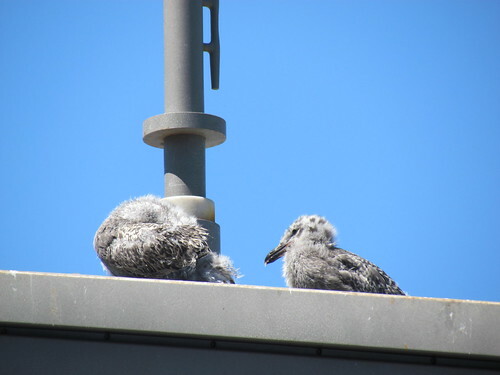 Here are some cute baby seagulls! I got a Thai Iced Soymilk from Hodo Soy Beanery, and would have gotten a donut from Pepples, except no one was at the stall to sell them to me. The Thai milk was not the greatest, to be honest, their strawberry banana smoothie was my favourite drink from Hodo. I love sitting down at the Ferry Building, I could do that every single day. 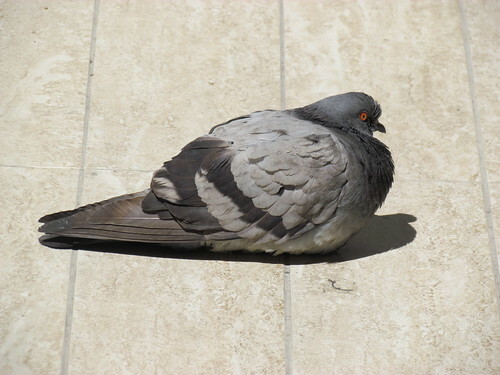 By the way, San Francisco, your pigeons are all super plump! Finally I tore myself away and headed back off to get some dinner. Before dinner, I wandered around Union Square and the Westfield. There were a few cute shops there, but ultimately shopping kind of bores me. Then it was time for my early dinner. 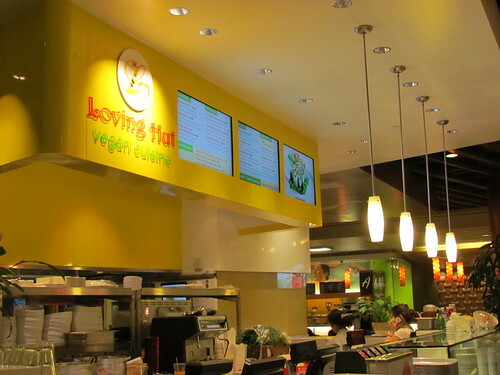 There is a Loving Hut in the Westfield, so I headed there to get some food. I chose from some of the hot food in the bain maries, because I needed something quickly. 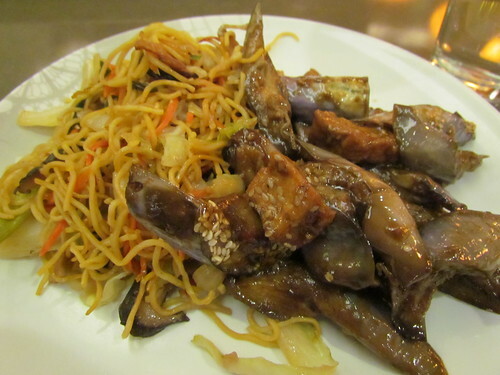 I got some yummy noodles and some great eggplant and tofu. It was pretty yummy. However, to be honest, having my last meal of an amazing foodie trip in a Westfield food court was kind of sad! But the Westfield was close to my hotel, where I then power walked to catch my shuttle off to the airport. The rest of it is fairly unexciting. 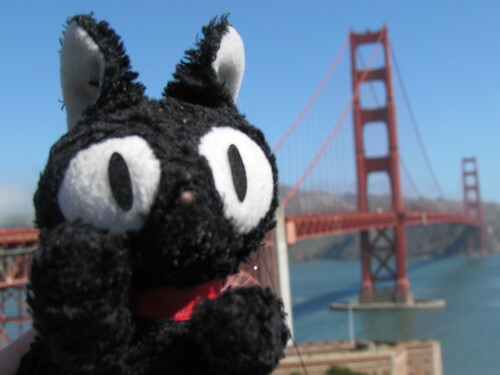 I bought some touristy San Francisco trinkets while waiting for my plain, then took a 12 hour flight to Auckland. The guy at check in didn't charge me extra for checking my second little suitcase that was full of food, which was nice. The flight was OK, but half of the food the brought out for my 'vegan' meals contained dairy. Ummmm.... seriously? Sigh. I arrived in Auckland at about 5.30am for a four hour layover, and was able to get some sushi for breakfast and grab a quick name in their pod chairs, before finally getting on my flight home to Brisbane. I had no problems getting my food stash through customs, and then it was hello to my parents, into the car and home to those beautiful little kitten faces. It was good to be home! 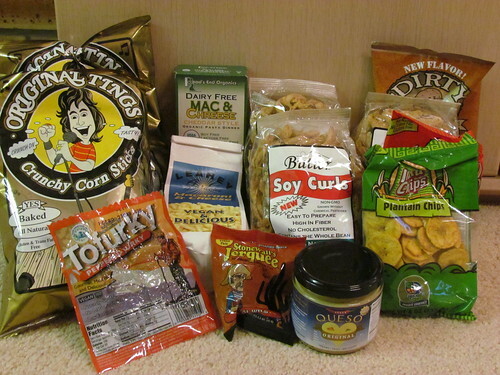 I will have one more US-related post, mainly just a bit of a wrap up and then a review of the food I brought home with me! What's this? Two posts in one day? Madness! Well, maybe, but I have been very slack about getting these up, and VeganMoFo is but nine days away. I shall be participating this year, so need to have all my USA trip posts done and dusted before October. Anyway, I believe I promised exciting restaurant food? My feet were my friends again today as I walked from the Mission along Division St to my next destination. let me tell you, walking along Division St is pretty scungy. I was a bit worried for a second. Also I started getting panicked that I was absolutely going to the wrong place. But thankfully, eventually, I found my restaurant. 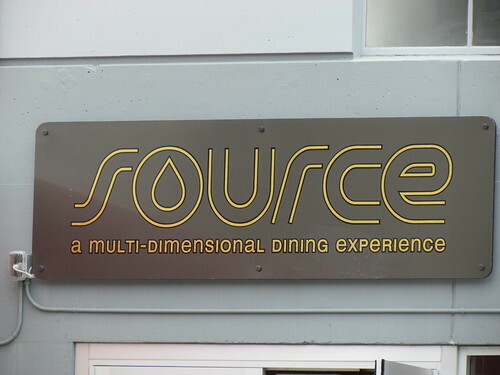 Source is a super cute, quirky little restaurant that I had read much about on the PPK and on Vegansaurus. See above re. quirky. Hee. 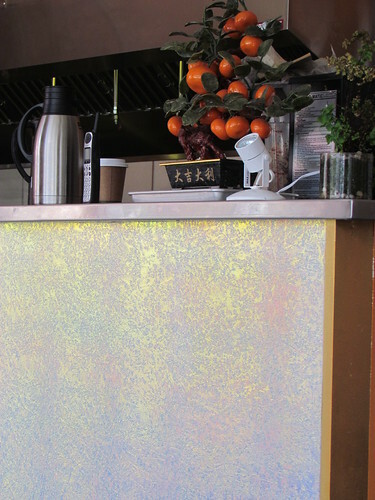 The paneling on their bar - it shimmers! 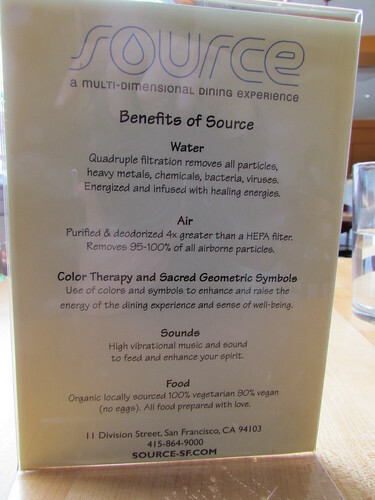 The only downside about visiting Source during the day, is that the light coming from outside means you can barely see the nifty light therapy. 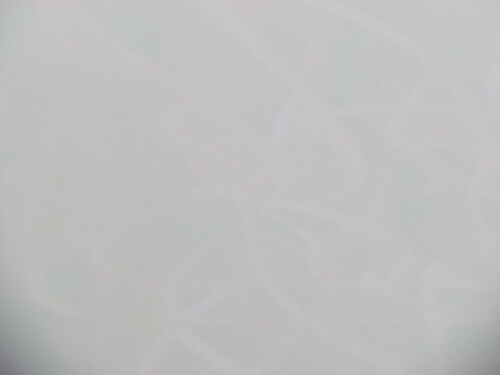 Squint and look closely at this photo and you can just make it out. 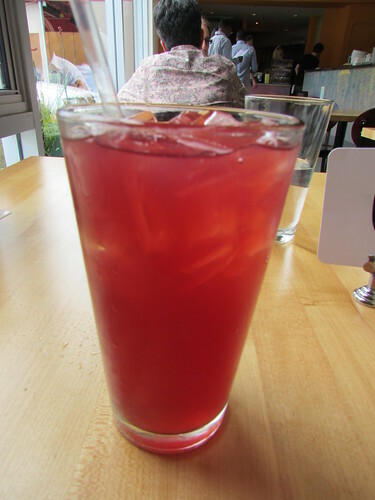 I ordered a refreshing Blueberry Lemonade. 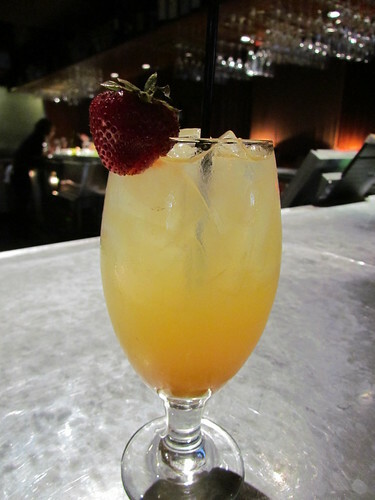 I love American-style lemonade, and all the tasty flavours that can go with it. I wanted to keep lunch relatively light, because I had some pretty big dinner plans. What is this restraint? I hear you cry. I don't know either. The menu is amazing, and I perused for some time before deciding on the Chicago Bow Wow: Relish, tomato, onions & cheddar, only because I am awesome and vegan I had some sort of cheesy sauce. 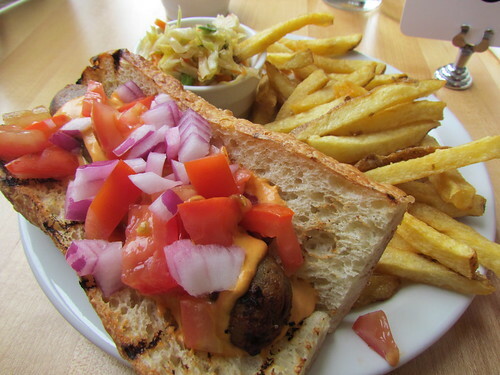 The sausage is an apple-sage Field Roast sausage. It was yummy. It also came with some coleslaw, and the best fries of the trip. I was on my own, with my charming accent, wearing my awesome vegan t-shirt, so a nice waiter also gave me some extra garlic sauce to go with my fries. People there were super nice and chatty! I had originally planned on getting one of their Snowballs or other assorted treats for dessert, but they were a bit low on them at that point. 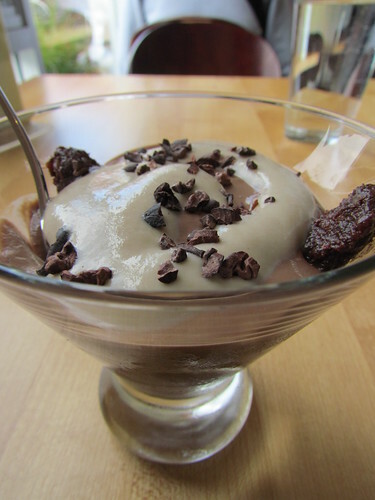 However, I did have this amazing raw chocolate mousse. Oh wow, this blew my mind. Source was fantastic, I really enjoyed it and am so glad I found my way there. The only thing is, even though I loved my lunch, I have sadness over things I didn't order. Specifically, the Truffle Macaroni and Cheese. My soul will now never rest until I can go back there and eat this. Possibly with an starter of the baked artichoke and spinach fondue. And a star anise shiitake soba salad. You know, just a nice small meal, really. Afterwards I went for more of a walk. To another grocery store. 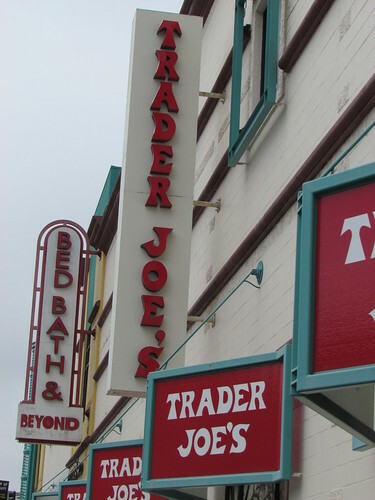 I had yet to make it to a Trader Joe's, and there was one right near Source. I didn't actually buy anything here. 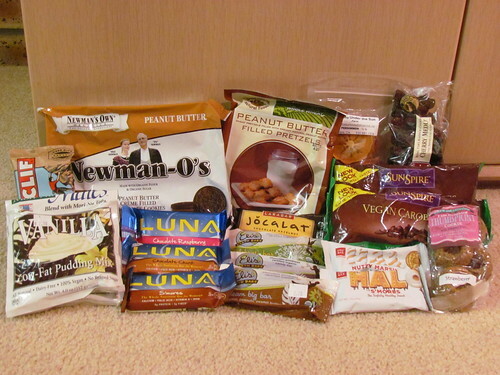 Nothing seemed to be in a logical place, and everything was TJs brand so it all blended, so I seemed to have missed all the awesome vegan snacks people say that they have there. I walked back to the hotel via the Civic Centre, which was much prettier in the sunshine compared to the grey drizzle of the previous day. There was this rather amusing sing on the playground there. 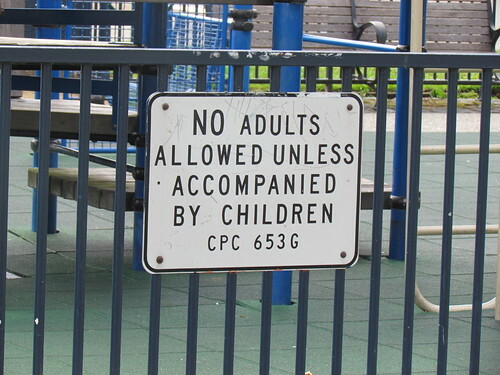 For the record, there were two adults and zero children playing in the playground. I then went back to my hotel, where I spent some time packing as I was leaving the next day and would have to check out in the morning. I also had a small nanna nap. I know I am super lame. But I just needed my rest before dinner. I was very excited about dinner. One of my friends that I used to work with was actually doing a placement at UC Davis, and was coming in to San Francisco for the night to have dinner with me. That is exciting! Oh, and so is this. As if I wasn't going to make it here. 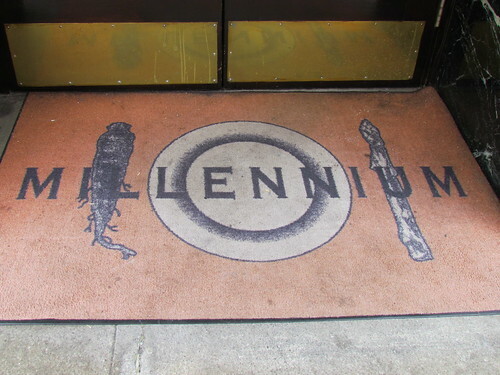 Millennium is a restaurant that every vegan should try and make it to at least once in their lifetime. I had very high expectations for my dinner here, and I am happy to say that I was not disappointed at all. Please excuse the darkness in the following photos - it was mood lighting. Tash was running a bit late, so I waited at the bar and ordered a Chamomile Lemonade. This was beautiful. In retrospect I so should have also ordered some of the steak fries. Oh well. 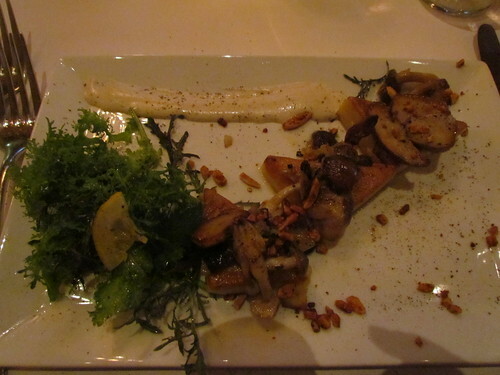 For my appetizer I ordered the Chickpea Panisse, which was incredible. The description reads seared Portobello, Clamshell and Cremini mushrooms, spring onion agrodolce, almond-garlic cream, smoked pimenton and aleppo chile toasted almonds. Meyer lemon, bitter green and herb salad. That there's some fancy talk for so delicious you might just cry. 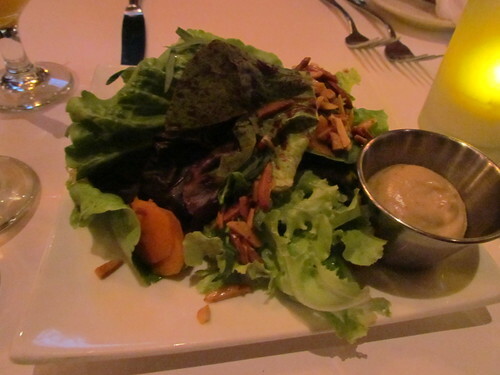 Tash had this beautiful salad, which I thought was the Wilted Bloomsdale Spinach Salad, but doesn't quite look like it matches the description. 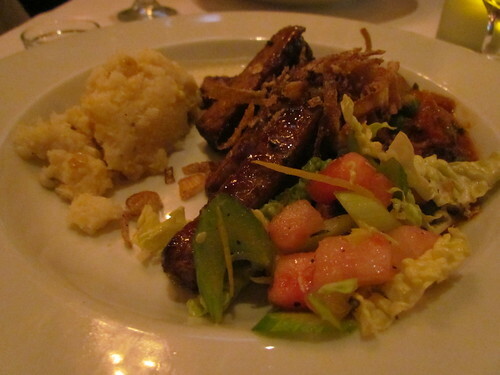 For my main I had Bourbon and Maple-Glazed Smoked Tempeh, with tomato etouffee with English peas, cauliflower and baby carrots, creamy roasted sweet corn grits, celery-cabbage slaw and lemon-caper cashew cream. So amazing. 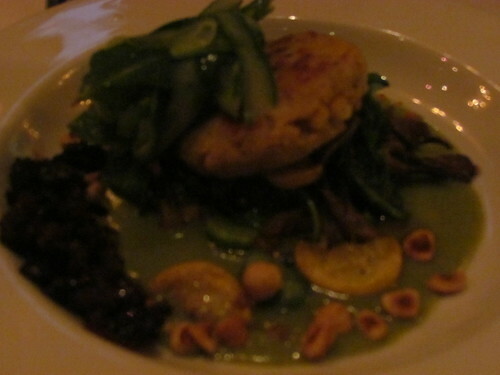 Please forgive this horrific photo of Tash's main, the Barley-Chickpea Cake with grilled maitake mushrooms, crookneck squash, fava beans and rapini greens, balsamic roasted torpedo onions, spinach and sorrel puree, aleppo chile-black olive tapenade with toasted hazelnuts and cucumber-mint salad. 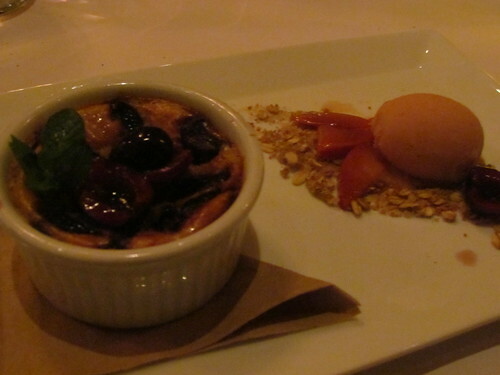 For dessert, I could not go past the Clafoutis - sunken souffle with cherries, nectarine icecream, salted nectarines and oat and nut crumble. 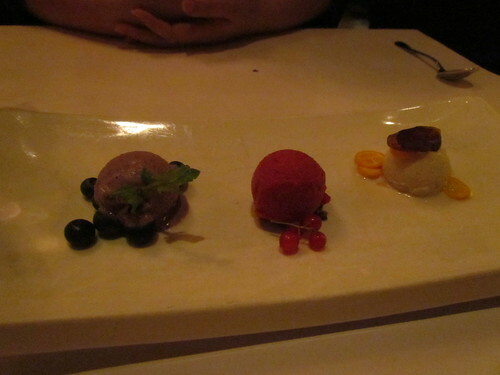 And Tash had this beautiful trio of sorbets. 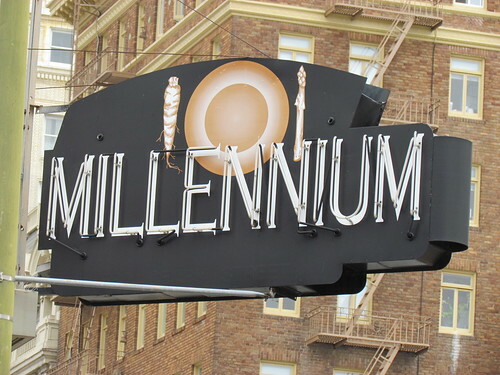 Millennium was such a magical, perfect experience that I find myself without words to describe it all. It was just... perfect. Everything that I hoped and dreamed. This should definitely be on your list. 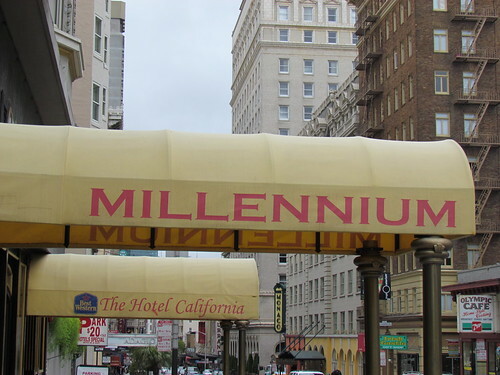 We strolled back to the hotel, which was joyously only two blocks away, and I was so delightfully happy. But wait, remember that raw peach pie? I had to eat it when we got back to the hotel, as I would be checking out in the morning and roaming around all day, and it needed to be safe in a fridge. So I ate it. It was pretty good. Obviously couldn't compare to the magic that came before, though. And then there was sleeping. And on the morrow, my last day in America before my journey home.